University of Mississippi faculty are among the leaders of a new program designed to improve teaching and learning in the state’s higher education institutions by reducing textbook costs and enabling faculty customization of curricula. “Z-Degree Mississippi” is a three-year plan to expand adoption of open educational resources, or OER, at the state’s eight public universities and four community colleges. The effort is funded by a $200,000 grant from the William and Flora Hewlett Foundation and $80,000 from the UM College of Liberal Arts. Z-Degree Mississippi will unfold in three phases. Phase 1, which runs through June, entails establishing at least one OER course at each of the 12 colleges and universities. 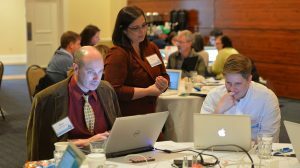 Phase 2, which begins in July and runs through June 2017, involves expanding OER adoptions at four universities and two community colleges, focusing on those schools with the most faculty champions and momentum. It also includes the development of new OER courses to achieve 50 percent completion of general education/associate’s degree pathway. Phase 3, July 2017 to June 2018, is to complete the OER general education/associate’s degree pathway at two Mississippi schools and continue expanding the pathway at others. The goal is to achieve a four-year Z-degree pathway by 2020. UM faculty in the inaugural phase are Heather Allen, assistant professor of Spanish; Susan Grayzel, professor of history; Rachel Johnson, instructor of writing and rhetoric at the Tupelo regional campus; Rhona Justice-Malloy, professor of theatre arts; Maureen Meyers, assistant professor of anthropology; Jason Solinger, associate professor of English; Joseph Ward, chair and professor of history; Marc Watkins, instructor of composition and rhetoric; and Brooke White, associate professor of art. Z-Degree Mississippi courses being taught by UM faculty include Introduction to Anthropology, Beginning Photography, Digital Photography, Advanced Black-and-White Photography, Advanced Digital Photography and Survey of English Literature. An estimated one-third to two-thirds of students nationwide no longer purchase textbooks. Campus bookstores have difficulty supplying adequate numbers of textbooks, and instructors face challenges teaching effectively with traditional textbooks because students aren’t buying them. For more information about Z-Degree Mississippi, visit http://oer.olemiss.edu.